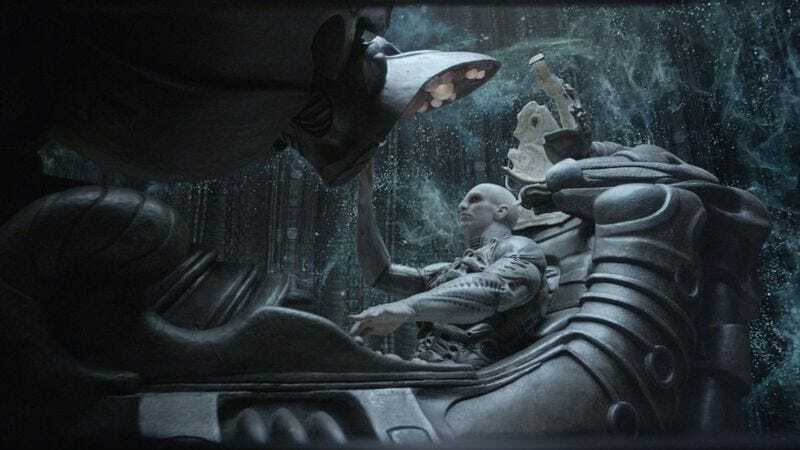 When the hype machine for Prometheus was first being constructed, one of the aspects that sci-fi fans were the most curious about was its connection to the Alien movies. The trailers hinted at a lot of familiar imagery, but ultimately the movie was less of a direct prequel to Alien and more of a distant cousin. That’s all going to change with Prometheus 2, though. Or maybe with Prometheus 3? We’re not sure, but it’ll definitely have changed by Prometheus 4. That’s according to director Ridley Scott himself, who told German site FilmFutter.com that it’s going to take a while for the Prometheus movies to properly set the stage for the Alien series. “It won’t be in the next one,” he says, referring to the Prometheus sequel that’s set to start filming next year. “It will be in the one after this one or maybe even a fourth film before we get back into the Alien franchise.” Also, despite all of the grand ideas that Prometheus hinted at, Scott suggests that the whole purpose of these movies is to explain how and why the xenomorphs from Alien were created. We’re not sure how it could take so many extra sequels to say “they were bred to look scary and kill people,” but that’s why we’re not famous directors. Either way, look forward to at least one more movie full of vague Alien references and then an eventual sequel full of direct Alien references. Also, Neill Blomkamp is still making his actual Alien movie.